Let me congratulate all those who receive their degrees today at this General Convocation on the achievements they have made. It is no secret that embarking on an academic enterprise is stressful, heart-burning and fear-stricken. Yet, the nature of humankind is to breed such ambitions, go for the impossible and finally, emerge as winners. We are here today to appreciate and recognise the job well done by you. All the best for a fruitful and productive career ahead! 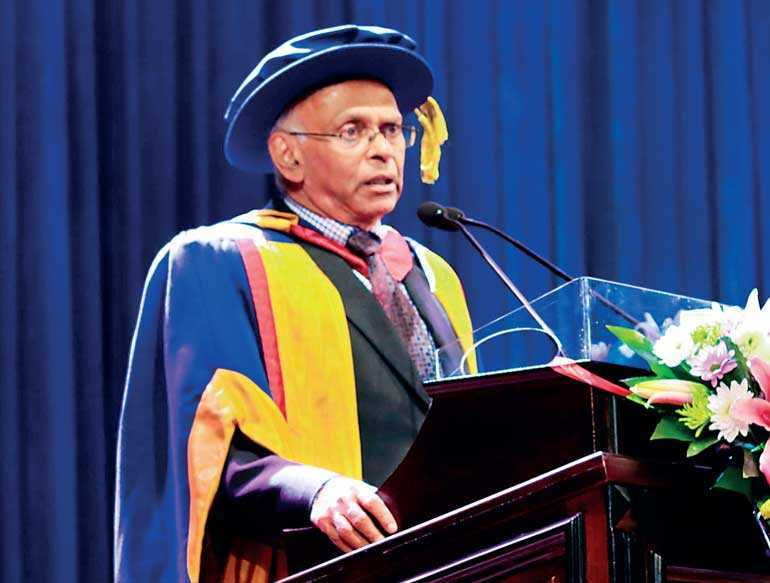 The Open University of Sri Lanka has to play a special role in Sri Lanka’s educational arena. We all frown upon exclusivity today and strive for inclusiveness. Many years ago, education was a right and privilege of a few in society. However, modern societies develop not on such limited access to education, but on the building of a critical mass of knowledgeable people. When public education became the order of the day, limitations on public funding imposed an effective constraint for achieving this goal. Hence, public educational institutions had to design models of outreaching the maximum number in society in a cost-effective manner. The distance-learning mode started some 200 years ago, in which the teacher and the student were in two different locations, provided the answer to this problem. It began through correspondence courses delivered to students via ordinary mail, which is now derogatively called ‘the snail mail’. The obvious deficiency is the time taken and the limited one-way correspondence which each party can make with the other, known as 1.0 communication systems. With the advancements in information and communication technology, commonly known as ICT, perhaps that old model can now be viewed as primitive child’s play. Today, ICT has allowed us to communicate with each other on a real-time basis, and the associated low-cost video-conferencing has made it a living experience. Hence, all the mainstream universities have gone for this mode of delivering knowledge to students, via what is now called Massive Open Online Courses or MOOCs. Thus, anybody can learn from Massachusetts Institute of Technology or Harvard via MOOCs. This has been facilitated by the digitisation of libraries and new software packages like ‘digital blackboards’, which connect students with teachers in any part of the world, in what is now known as 4.0 communication systems. This is the next step forward for the Open University. The Oxford historian Yuval Noah Harari has gifted mankind with two works of erudition recently. The first book, published in 2011 under the main title ‘Sapiens’, has documented a brief history of humankind. The second, a sequel to the first and published in 2015, is titled Homo Deus, and has presented a brief history of tomorrow. When read together, mankind will be able to answer two questions which have been puzzling them ever since they developed cognitive skills. Those two questions are, firstly, from where Homo sapiens came and, secondly, where it would go from here. Harari has concluded his book ‘Sapiens’’ with an unusual observation. That is, Homo sapiens – Man, the Wise – has in its evolution, supported by developments in cognitive skills, now acquired the divine power of creating and destroying life. This feat has been accomplished through the advancements in science and technology which the world has seen especially in the last fifty years or so. Creation has come in three forms. First, man has been able to add inorganic bionic parts to living species, to facilitate it to do things in the absence of the corresponding naturally grown body parts, or reinforce when such natural parts are defective. Accordingly, humankind is now fairly close to an era in which the blind will see, the deaf will hear, the dumb will speak and the lame will walk, previously miracles performed only by divinity. Second, man has used genetic engineering to duplicate existing life or create altogether new life. Third, man has developed synthetic viruses, especially in the computer field, that would multiply themselves into new lives through their own mutation processes. In this last creation, humankind had given life to inorganic matter. The destruction has come through the development of mass destruction weapons which, when activated by deliberate human action, would destroy the entire planet in a fraction of a second. 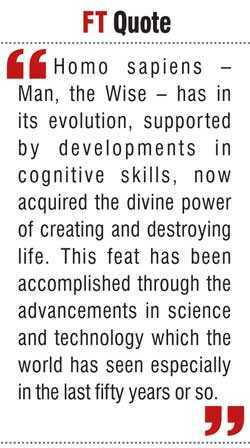 Traditionally, Homo sapiens had assigned these creationist and destructive powers to an unseen super-being titled God. Now, the very same Homo sapiens has appropriated this divine power through advancements in science and technology, again one of its own creations. What this means is that science and technology hang in balance in delivering both promises and disappointments. If handled properly, promises will bring in success and prosperity to mankind. 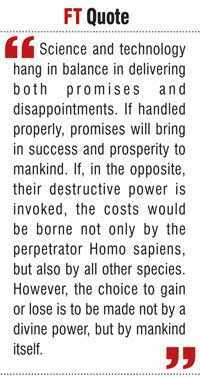 If, in the opposite, their destructive power is invoked, the costs would be borne not only by the perpetrator Homo sapiens, but also by all other species. However, the choice to gain or lose is to be made not by a divine power, but by mankind itself. The divine power or God, as Bhagawad Gita has put it, does not reward the virtuous nor does it punish the wicked. 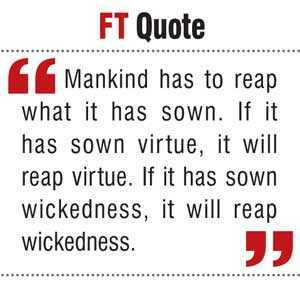 Hence, mankind has to reap what it has sown. If it has sown virtue, it will reap virtue. If it has sown wickedness, it will reap wickedness. In the second book, Homo Deus, Harari has argued that humankind has made this choice wisely up to now. While it has harnessed the promising side, it has refrained itself from invoking the destructive side, knowing well the destructive power it possess. The self-fear has thus prevented the world from self-destruction. Hence, the promising side of advancements is always beneficial to mankind. But the destructive side is bad and should be kept under strict controls. But even in the promising side, there is an unintended consequence which Harari has not seen. The promising things are promising, not immediately, but after the lapse of some time. For instance, when society moved from the horse cart to motorised vehicles, this invention could not be understood by many, and there was wide-scale objection to it on the grounds that it wreaked havoc in the environment. Hence, it took a long time to be accepted by all. But this long time is made up of a series of short cycles. In each of these short cycles, these promising advancements replace the existing systems, which had been used by people for many generations and therefore have become a natural part of their lives. But these promising advancements are taking place today at an exponential rate, thereby replacing the existing systems too at that rate. Thus, every morning we all wake up to news that a big thing has been invented in some part of the globe. This requires us to re-learn, re-remember and re-communicate, the three essential skills we have to master in improving our cognitive abilities. But that engagement is stressful, heart-paining and fear-stricken. Hence, it opens an unknown, fearful future to us. These new inventions are, therefore, as the Austrian-American economist Joseph Schumpeter had put it in 1942, ‘creative destructions’ that are necessary for society to advance forward. But, within the short cycles, they bring about enormous changes to living patterns, cultural practices and social behaviours. Those who are able to adapt to such changes will pass through them without suffering physically or mentally. But that group is limited and exclusive. The more common are those who are unable to adapt. They, therefore, view new changes as fearful monsters waiting to prey on them. This personal fear is then expressed as a fear about the destruction of culture or society at national levels, and the destruction of all mankind at global levels. Hence, the natural reaction to these presumed monsters is to categorise even the promise-delivering inventions as disappointing failures. Societies today are full of people who subscribe to this latter view. Therefore, there is a need for measures to make them inclusive, same as the need for making general education inclusive. It is the key for surviving and succeeding in a world with an unknown and dreadful future. This is the challenge we all face today. When meeting this challenge, the findings in the Computer Literacy Survey being conducted by the Department of Census and Statistics every quarter are well-revealing. Sri Lanka’s average computer literacy at 28% of the population between 5 and 69 years is very low compared to its peers in East Asia. The computer literacy of those between 10 and 29 ages at 41% to 60% is well above the national average and therefore promising. But they are not the opinion makers in the country. Those opinion makers, comprising adults of over 40 years, are well below the national average and have a computer literacy of less than 20%. In the case of senior citizens between 60 and 69 years, it is just 6%. This shows the inability of a majority of Sri Lankans to adjust to changes that are brought in by new inventions. This natural fear has led to an overall rejection of the changes associated with new inventions. These low numbers are discouraging, but not without hopes at all. It is all about how we look at the glass: half-full or half-empty. A familiar story about selling shoes in the newly opened for trade Africa in the late 19th century sheds light on this. Shoemakers of the world had sent their sales representatives to Africa to make an assessment of the possibility of selling shoes to native Africans. All representatives had reported back to their head offices that there was no possibility of selling shoes in Africa, because no one there was wearing shoes. However, the representative fielded by Thomas Bata, who at that time was operating from his native land Czechoslovakia under the brand name Zlin, but later built his shoe empire in Canada as Bata Shoes, had reported back in the positive. He had said that there was no one wearing shoes in Africa, and therefore there was enormous prospect of selling shoes in that Dark Continent. The result was that, in Africa as well as in many parts of Asia including Sri Lanka, Bata became synonymous with shoes and a household name. Thus, having a low digital penetration at the moment is a hopeful blessing, rather than a disappointing write-off. I have observed that many people above the age of 55 are quite capable of embracing new technology, if the right type of incentives and motivational factors are established for them to learn. A good example is provided by the Dompe e-Hospital, the first healthcare institution in Sri Lanka to introduce an ICT-based comprehensive patient management system. When a patient enters the hospital, his details are captured into the computer system at the reception, and a card containing a bar-code is issued. Thereafter, it is the hospital’s computer system which manages his every move, from OPD to lab to pharmacy to hospital ward to operating theatre and so on. It is the hospital staff members, who are now nearing the retirement age, that are operating the entire system. When a lady now nearing the retirement age was using her desktop with dexterity, I asked her how she learned the art. Her reply was swift and revealing. She said that previously she even dreaded to look at the computer at home used by her children. That was because she had thought that computers were for young people and not for old ones like her. But, when training facilities were offered to her, she had jumped at the opportunity and very quickly mastered the art. They had been trained by volunteer undergraduates from the University of Moratuwa during their free time. At the time I saw her, she was using her desktop just like a youngster, and she had been connected to almost all the social media. Hence, there is no need for us to give up hope. Sri Lanka can be converted to a digital society if young people, such as those who pass from the Open University today, make it their responsibility to impart digital knowledge to their elders. It will not only take fear out of their heads, but also convert them to future-oriented global digital citizens.